The flying bar is the horizontal support structure or bar that the Kabuki Drop system with curtain is hung from. In a theatre, you would “fly” the Kabuki Drop system from the flying bars. For events, you might use the rigging points in a venue or lighting truss that has been set up. You could also use a makeshift horizontal support such as running a horizontal lighting truss or pole between two lighting stands. Regardless of the flying bar used, it is important that the support is rated or endorsed to take the weight required for the Kabuki Drop. The perfect Kabuki fabric is one that is lightweight, durable and inherently flame retardant. IFR (inherently flame retardant) polyesters that can be sewn with minimal seams are the choice of the industry. Lightweight cloth is favored, to deliver a billowy effect. Different fabric materials and thicknesses are used to create different effects for the Kabuki Drop. For example, opaque, translucent or transparent fabrics all create different visual effects under stage lighting, video projection and daylight. The most common way to prepare the curtain is to fit it grommets. “A grommet is a ring or edge strip inserted into a hole through thin material, typically a sheet of textile fabric, sheet metal and or composite of carbon fiber, wood or honeycomb. Grommets are generally flared or collared on each side to keep them in place, and are often made of metal, plastic, or rubber. They may be used to prevent tearing or abrasion of the pierced material or protection from abrasion of the insulation on the wire, cable, line being routed through the penetration, and to cover sharp edges of the piercing, or all of the above.” Wikipedia. Grommets used for Kabuki Drops are always made of metal. To prepare to fit the grommets, first fold the edge of the cloth over to make a wide hem. You can purchase a grommet kit from a general hardware store, haberdashery shop or curtain maker. Just follow the instructions that come with the kit to attach the grommets. Or, you can learn how to attach grommets to the curtain here. Attach the grommets to either corner of the top of the curtain and the rest are spaced about 12” from each other, or wider depending on the number of drop points you intend to use. Instead of directly fitting the top edge of the curtain with grommets, a more sophisticated design is to make a header for the top of the cloth. The header runs the entire width of the cloth. The header is made from 3” nylon webbing. The bottom 1” has a length of Velcro (loop side) sewn onto the entire length of the header. 1” Grommets are attached to the top 2” of the header, evenly spaced apart. With this method, a corresponding length of 1” Velcro (hook side) is sewn across the entire top edge of the curtain. The curtain is attached to the header via the Velcro strips and the header is attached to the Kabuki drop point or mechanism. In the traditional “rolling pole” method, the grommets are directly placed over the drop points (“pegs”) to hold up the curtain. However, in most Kabuki Drop systems that use grommets, an additional attachment is required to connect the curtain to the drop point system. This is a large steel key ring that is allows you slide a loop-shaped object onto it. Typically, a 1.5” stainless steel split ring is used for Kabuki Drops. This is slipped through the grommets and then attached the Kabuki drop point or mechanism. Also known as a Spring Hook, this piece of hardware is metal loop with a spring-loaded gate. This hooks you to “lock” the carabiner onto the grommet and also attaches to the Kabuki drop point or mechanism. Also known as a “gyve”, this is a U-shaped piece of metal secured with a clevis pin or bolt across the opening, or a hinged metal loop secured with a quick-release locking pin mechanism. The bolt of the shackle is threaded through the grommet and the shackle is “locked” into place. The U-shaped part is attached to the Kabuki drop point or mechanism. Cable ties are an easy solution and are lightweight. Be sure to use cable ties that are at least 10mm wide to ensure they can hold the weight of the curtain. Check out a variety of other curtain attachments available from manufacturers such as J&C Joel. This method of preparing the curtain does use any grommets but uses Velcro instead. A strip of hook-side 2” Velcro (the hard side) is sewn on each top edge of the curtain; i.e. one strip each on the front and back. The Velcro is sewn across the width of the curtain. The attachment to connect the curtain to the drop point has to be custom made. Each attachments is made from a single 2”-wide strip of loop-side (the soft side) Velcro. The reason for using the loop side of the Velcro is because this side wears out over time and needs to be replaced. It is much easier to replace when it is not sewn down onto the curtain. This single strip of loop-side 2” Velcro (5” long) is looped through the straight end of a 2” D-Ring, folded over and sewn tightly together just under the D-Ring. This creates a “Velcro clip”, where the two ends of the Velcro act as the tabs of the “clip”. This allows the Velcro tabs to be “clipped” onto the top of the Kabuki curtain. The Velcro tabs attach to the corresponding Velcro strips sewn across the width of the curtain. (Think of the two flaps of Velcro on the D-Rings as breads and the top of the curtain as the filling – the curtain being sandwiched in the middle of the two flaps). The D link is then attached to the Kabuki drop point or mechanism. The use of Velcro allows for ease adjustments. 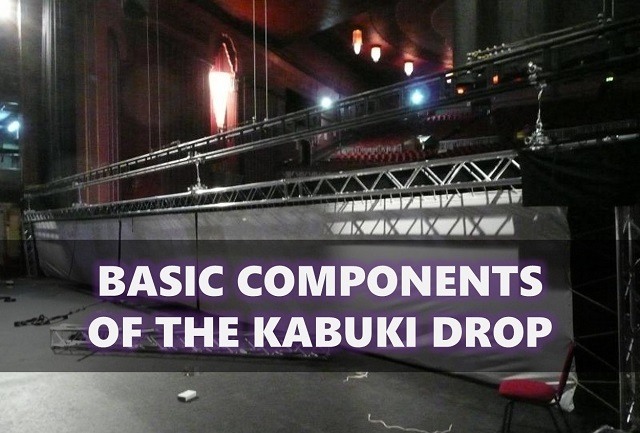 This is so that there is flexibility in terms of shifting of the rigging points, assuming different set-ups for the Kabuki Drop is used for the same particular curtain. Most Kabuki Drop systems, whether manual or electronic, require the curtain to be prepared with grommets, Velcro and/ or other attachments. However, there are a few manufacturers that have developed fabric clamp accessories so that the curtain does not need any preparation or grommets. This is especially useful if you are using a specific delicate fabric that you do not want to puncture holes in. The clamp system also allows for easy adjustment without the need to line up drop points and curtain attachments perfectly during set-up. Manufacturers of these fabric clamps include Gerriets, Drape Kings and MagicFX. The drop points refer to the devices or connections that attached the curtain to the flying bar and release the curtain when needed. For manual systems, the drop points can be a rolling pole with pegs, Velcro attachments, pins and loops or pins and sleeve. See “Manual Kabuki Drop Systems” for more details. For electronic systems, the drop points can be linear solenoids, electromagnet locks, gate catch release systems, catches, hooks, clips and pins. See “Electronic Kabuki Drop Systems” for more details. All manual systems are activated by some kind of wire cable or rope that releases the cloth from the drop points. In this case, a human or trained monkey manually pulls the trigger. All electronic systems use some kind of switch to allow an electric current to activate the drop point mechanism. The electronic Kabuki Drop can also be hooked up to a DMX control panel or other split connectors. DMX or DMX512 (Digital Multiplex) is a standard for digital communication networks that are commonly used to control stage lighting and effects. Disclaimer: This is a free resource site for educational purposes. To better illustrate points made in the articles, images have been used to accompany the information. Photo credits and links to the source material are given where applicable. If you are a copyright holder for any of the images and do not want your image used in this resource site, please contact us at info(a)magickabukidrop.com and we will remove the image within 24 hours. The authors accepts no responsibility for damages or injuries resulting from the fabrication or performance of any of the Kabuki Drop methods described in this website. Copyright text 2018 by Magic Kabuki Drop.